Q: How have you promoted the new showroom to your target audience? A: We’re reaching building industry professionals in a number of unique ways, including radio commercials, television ads, YouTube videos, social media and industry trade shows. 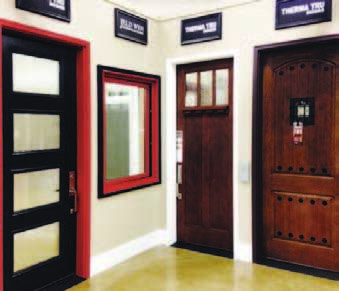 We recognize that there’s lots of competition for builders’ attention, so by reaching out in multiple ways we’re trying to impact them with our showroom message. Q: What have been some of your most effective strategies for getting builders and remodelers to visit the showroom? A: First, we make sure they know the products and services that are featured, so they understand we’re the best “go to” place in the market for their needs. Second, we encourage them to view this as “their showroom.” We’re here to partner with them. Our staff will follow their direction on what they need to make their project a success. Q: What are you personally most excited about regarding the new showroom? A: The interactive vignettes! These really encourage involvement from our customers and show so many product options. Q: What are some of your views about showroom expansion? A: My motto has been to keep it flexible, have a vision and go big. One way we did that was to involve our customers in unique elements of the showroom. For example, we have a dedicated conference room in the showroom that features the newest inspirational products from Therma-Tru and Fypon. By surrounding our customers with unique products we’re helping expand their project options.